Customize your experience with special extras like meals, massages & more! Our gorgeous riverfront setting is unmatched on the White River. Luxury accommodations with all the amenities just steps from the river. Enjoy luxury accommodations with all the amenities just steps from the river. The White River Record Brown Trout was caught at Rainbow Hole! Our riverfront accommodations are perfect for Families, Reunions, Corporate Groups, Retreats and Romantic Hideaways. Rainbow Drive’s small resort atmosphere provides personalized attention and service yet allows privacy for those who desire it. Our staff is very hospitable; we all take pride in our ability of helping you fulfill your expectations. We can provide fully catered business group fishing trips, his and hers private getaways, family reunions, and more. Why choose Rainbow Drive Resort? Pick the right lodging for your trip – camping, small cabin or the big lodge for a large group. Our weekend and weeknight rates can fit any budget. Relax at Rainbow Drive Resort and enjoy all the amenities including screened-in porches, satellite TV, fireplaces, Jacuzzi tubs & WiFi. Rainbow Drive Resort is a Family-Focused entertainment destination. Enjoy Golf & Massages or just relax along the riverbank! 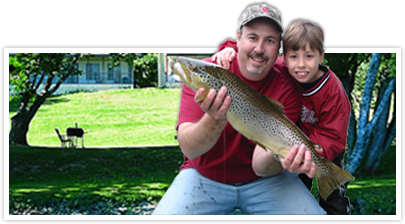 The deep waters of rainbow hole have always been one of the premier fishing spots on the White River for catching trophy’s and “pan frying size” – the best eating rainbow trout. 5 miles upstream from Cotter Public Access. Looking for a spontaneous fishing getaway? Last minute discounts and special offers on lodging with a 2 night stay!